Southern Brisbane Nerf Club: So long and thanks for all the fish! I think it was Heraclitus who said "Change is the only constant in life." And it's because of change that I must announce my withdrawal from the NIC. If you weren't expecting this announcement, that makes two of us. But, due to circumstances beyond my control, it is with a heavy heart I announce my departure from blogging, my Facebook page and Youtube channel. I tried to make things work and for a time it did, then my life outside of Nerf got to the point where ultimately something had to be sacrificed and after much deliberation it was unfortunately Nerf. Originally my plan was to blog for a year and see how things went, I started my Youtube channel shortly after and things were slow to start but after doing the half hour Nerf news show, things started to gain momentum. Blogging, managing the Facebook thing, researching for the next post and filming editing then uploading Youtube videos took up a lot of spare time (a lot) but it was time I was happy to donate to keep my readers informed, but now I have very little spare time with which to do it all in, not enough spare time at all actually. I've come to know some fantastic people and companies over the last six short months. Jay Nerf (keep an eye on this guy), has been an awesome fella, always welcome for a chat and just a really nice guy and I wish him all the success in the future. Prime Time Toys, Zuru Toys, Tek Recon and especially Hasbro Australia, I'd like to thank you all for your support over the last few months. It's been great having you on board. And to Andrea from Hasbro Australia's PR, I only wish we could've worked together longer. Lastly, a big big thanks to Ash from My Last Dart. He has supported my blog from the beginning and has been a great help in getting my blog off the ground. Surely, any success my blog has/had, was because of his advice. Undoubtedly my best friend in the NIC. There are a few things I'd have liked to achieve/accomplish. I'm disappointed that I wasn't able to host a game, at least one would've been nice. It just wasn't meant to be I guess, I did have a venue picked out that would've been perfect for a CTF match but the owner pulled out. I'm also upset that I'll not be able to stick around a bit longer and see my blog grow. It would seem that things were just starting to pick up for my blog too and it's saddening to have to cut things so short. I'd like to personally thank all the people that have subscribed to my YouTube channel, LIKED my Facebook page, followed and read my blog articles. You're the people I did this for. I'd like to say that I might return later on in the future but it is unlikely. I'd like to leave you know with a pic that I've had for some time but never posted. 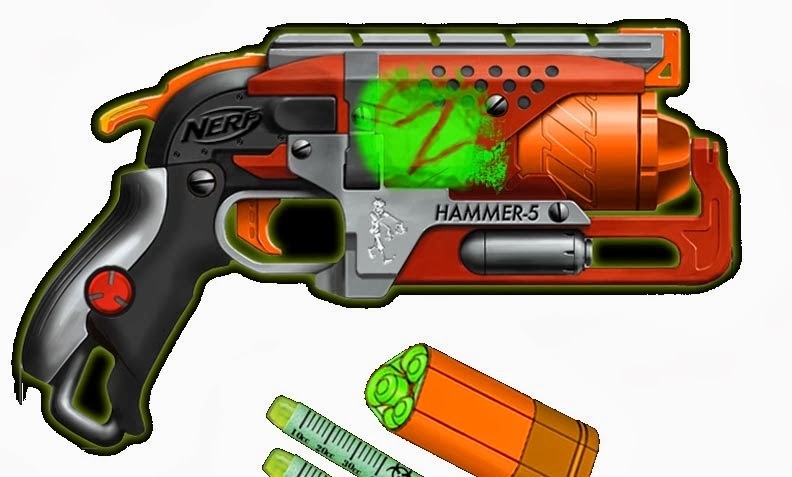 It's Hasbro's concept art for the Hammershot that shows an alternate name (Hammer 5) and different designs for Zombiestrike darts. Thank you all, keep being awesome. AH crap, I had Nerf mods and reviews and urban taggers who both retired which left you and basic nerf and tactical tag as the best blogs and now your leaving!? what is the world turning to? Sorry to see you go man, as I am a nerf modder myself, I wish I could do something to help. Good luck with your future. Aww man, I just started paying attention and subbed to all your pages. Sorry to hear that you're not going to be active anymore, I really liked your reviews, you were pretty attentive and quick with new blaster information. Good luck SBNC! Oh... :( Darn, I always looked forward to seeing your new posts and videos. Anyway good luck on what you are doing. Elite Suction Dart 12 & 30 pack release date? A email which that I got and read with my eyes.